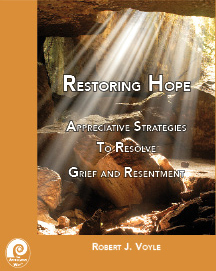 Practical Appreciative Inquiry based strategies to effectively resolve grief and resentment. This book is a gold mine of practical methods to make things better. Ed Leidel, Episcopal Bishop and Congregational Coach serving North America. 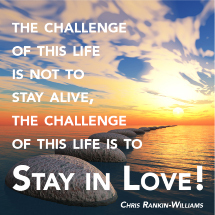 Rob Voyle has produced the most comprehensive manual for dealing with the consequences of serious negative life events. Andy Austin, author, The Rainbow machine: Tales from a Neurolinguist's Journal. Healing: We create opportunities for people to experience transformational insights that lead to new ways of living, working, and being in the world. This program is based on Rob Voyle's new book: Restoring Hope. How people's perception of time influences painful memories. The dynamics of painful memories and how to resolve them. To rapidly resolve grief so that people can remember their loved ones with love and gratitude rather than not-forget them by being miserable. How to help people forgive and sustain a forgiving attitude toward those who have hurt them. One day 6 contact hours of continuing education credit. 2.5 day 14 contact hours of continuing education credit. To provide participants a model of painful memories and how to resolve them. To provide participants with strategies to rapidly resolve grief . To provide participants with strategies to forgive and sustain forgiveness. This program is presented following the Introduction to Appreciative Inquiry training program and will typically begin on a Wednesday after the lunch break. The 2.5 day program will allow opportunity for participants to practice the strategies and develop their expertise is helping clients resolve grief and resentment. 9:00-12:00 Developing Resources to Compassionately Respond to Difficult People. Accommodation and facility use fees are extra and are dependent on the training locations and will be specified on the registration forms. Meals between sessions are typically provided for commuters. Rob Voyle is an ordained Episcopal priest, psychologist, and coach. 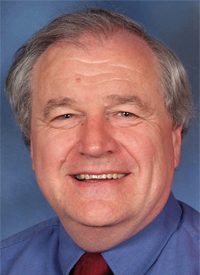 He is the Director of the Clergy Leadership Institute and author of numerous practical resources for applying the Appreciative Way to a variety of church and coaching situations.